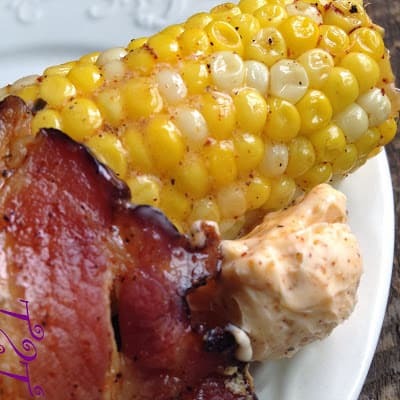 5 Recipes Using Gourmet Warehouse and they are: Applewood Smoke Seasoned Butter, Yukon Gold Baked Potatoes with Applewood Smoke Seasoned Butter, Bacon Wrapped Corn on the Cob, Calico Bean Bake and Baked Cherry Jalapeno BBQ Ribs. they asked me if I would be interested in sampling some of their products. We would be more than happy to sample their products! I am a huge fan of marinades, barbecue sauces, spice rubs and seasoning mixes. The products I selected to sample were: Applewood Smoke Spice Rub & Seasoning and Cherry Jalapeno BBQ Sauce-Mild. Gourmet Warehouse has a 20-year history of making wonderful products. Gourmet Warehouse is located in the heart of the low country on Hilton Head Island in South Carolina. They produce their delicious products- Marinades, BBQ Sauces, Spice Rubs/Seasoning on Hilton Head Island. Check out Gourmet Warehouse to learn more about their amazing and delicious products. Thank you so much Gourmet Warehouse for giving me this opportunity to sample your products. 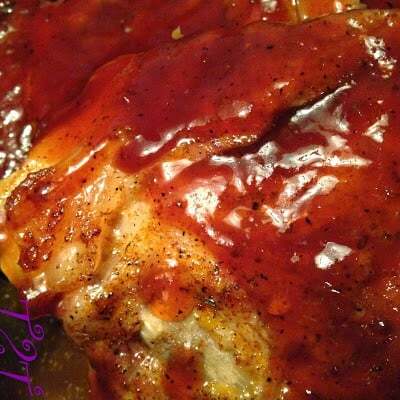 My husband and I absolutely loved the Applewood Smoke Spice Rub & Seasoning and Cherry Jalapeno BBQ Sauce. I hope you enjoy all of the recipes here, we sure did! 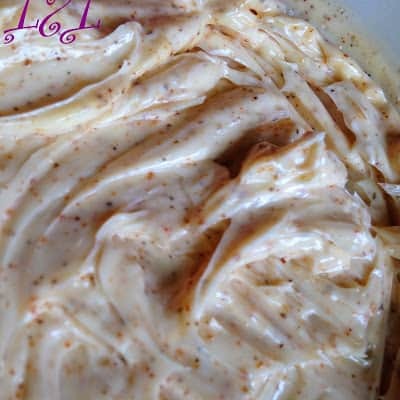 *Seasoned butter is fantastic on grilled steak, chicken, fish and vegetables. Using a fork, blend seasoning into softened butter. Refrigerate for 1 to 2 hours before serving. Pierce potatoes twice with a fork. 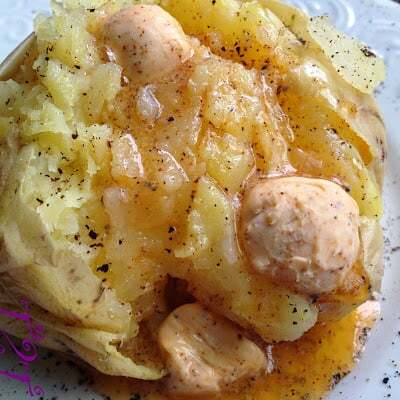 Drizzle each potato with 1 teaspoon olive oil. 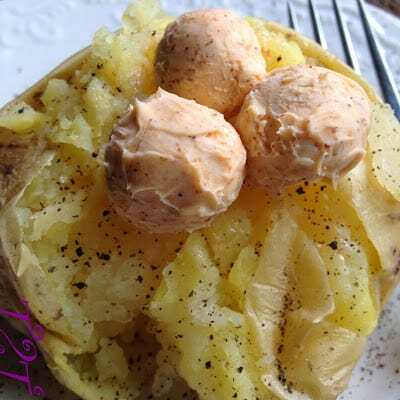 Wrap each potato in foil. Bake at 350º for 1 hour or until potatoes are fork tender. Remove husks and silk from corn. 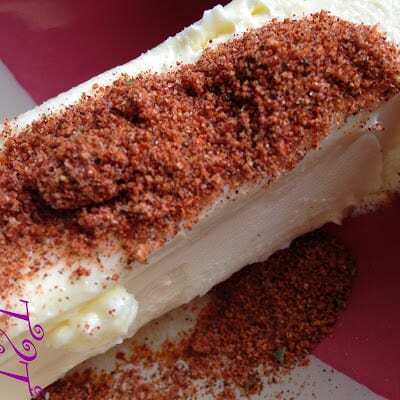 Generously spread ears of corn with softened butter. 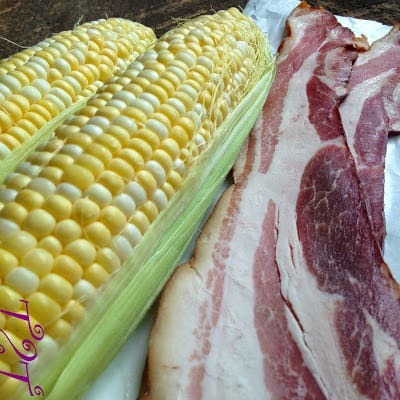 Wrap 1 slice of bacon around each ear of buttered corn. 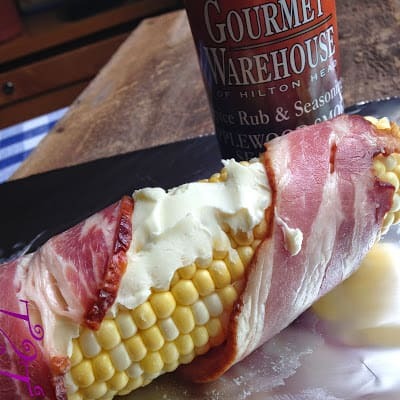 Place bacon wrapped corn on pieces of foil. 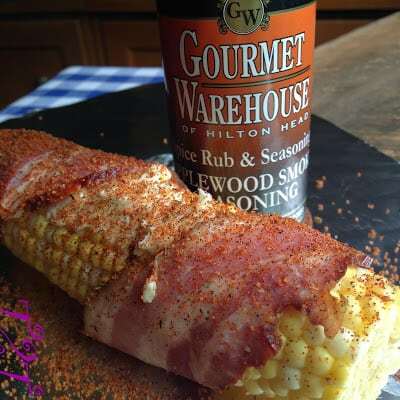 Sprinkle corn with applewood smoke spice rub and seasoning. Wrap ears of corn in foil. Bake at 350º for 1 hour and 15 minutes. 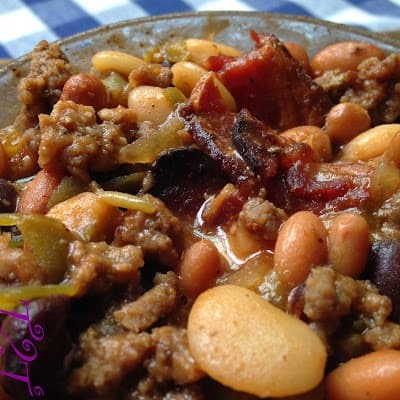 Fry ground beef and pork in a medium skillet, add 2 teaspoons applewood smoke spice rub and seasoning. Brown meat until no longer pink inside. Drain off fat and set aside. Fry bacon in a large skillet until crisp; remove bacon from skillet, drain on paper towels and set aside. Drain off fat in skillet, add chopped onion and cook until tender. Add brown sugar, ketchup, cherry jalapeno bbq sauce, dry mustard, 1/2 teaspoon applewood smoke spice rub and seasoning; simmer for 15 minutes. Chop bacon. 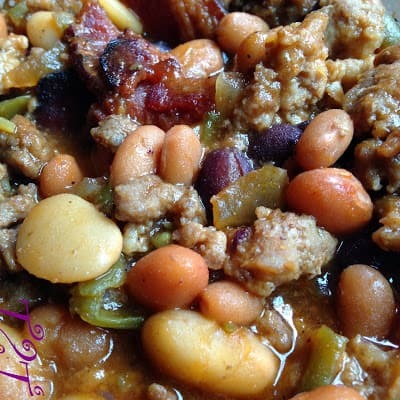 In a large oven proof bowl or baking dish, empty cans of beans; add browned meat, chopped bacon; stir in ketchup mixture. Mix well. Cover dish with tin foil and bake at 350º for 1 hour. Uncover and bake for 30 minutes longer. Place ribs in a large roasting pan. Add garlic cloves and sliced onions. Sprinkle with apple wood smoke spice rub and seasoning. Cover pan tightly with tin foil. Bake at 400º for 1 and 15 minutes. Remove roaster from oven, remove foil and drain off fat. Pour bottle of Cherry Jalapeno BBQ Sauce over ribs. Cover pan with foil and bake an additional 45 minutes to an hour longer.